Conducted survey and assessment of collections backlog to prioritize processing and provide immediate research access to over 4,000 LF of unprocessed materials. Wrote collections disaster response plan. Developing student training modules on processing archives and handling materials. 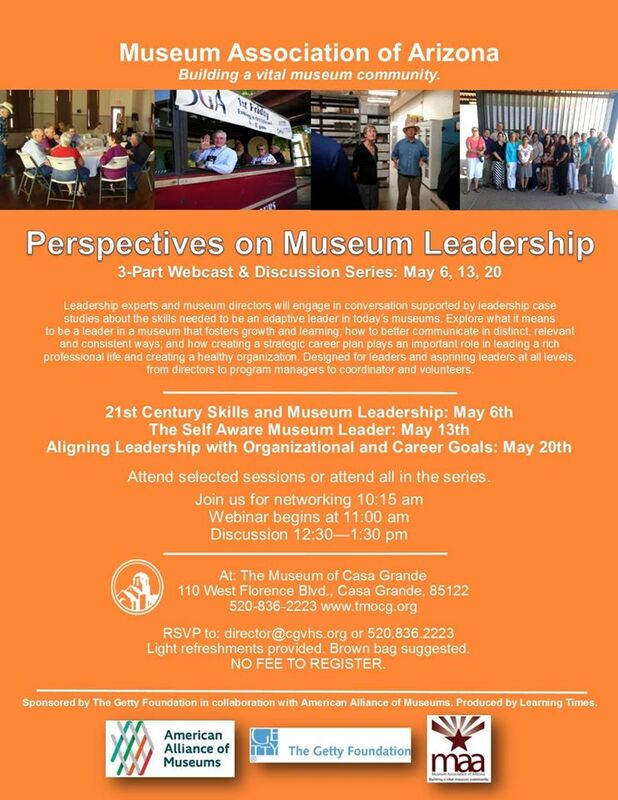 Initiated Pinal County Museum Meet-Up, a no-cost forum for rural museums and cultural centers to engage with fellow leaders, cross-promote, and share resources. Developing Pinal Museums promotional website portal utilizing WordPress. 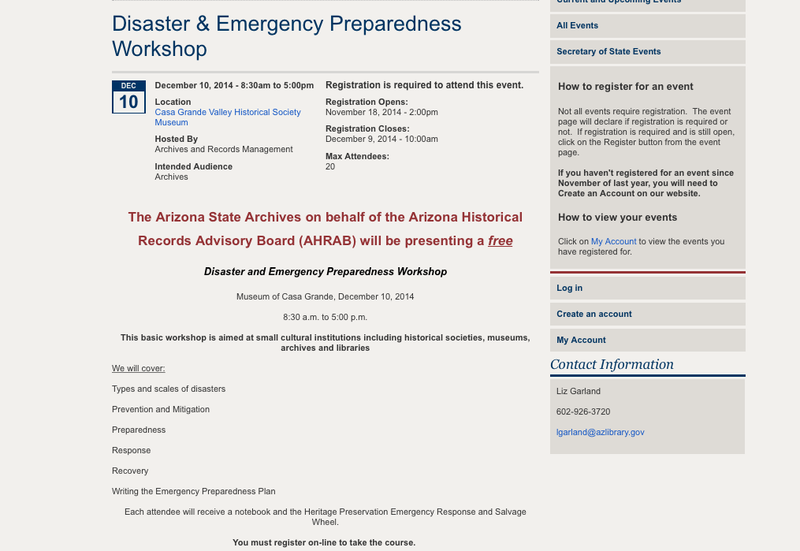 Designing layout and content for Pinal County Museums. 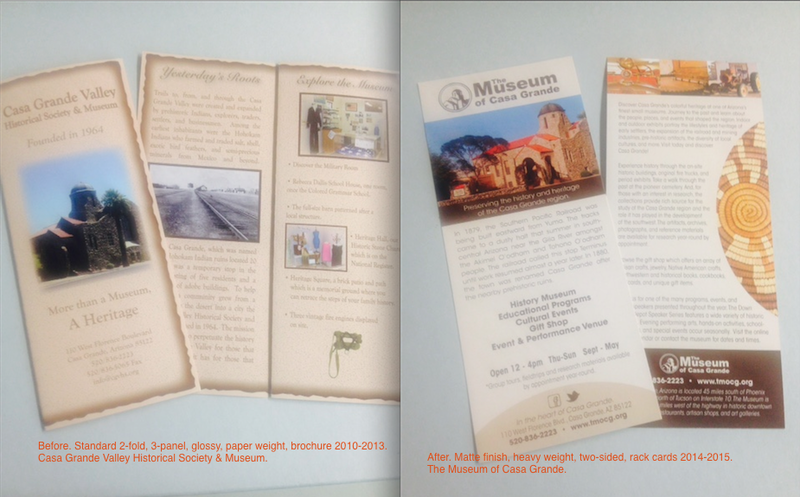 DRAFT COPY of Pinal County Museums brochure. Planned and installed gallery exhibits and quarterly off-site public exhibits. Produced monthly performance events in partnership with the BlackBox Foundation. Processing project manager for The Gorraiz Collection. 40LF of photographic images and negatives arranged and processed with interns. Initiated public access PDF finding-aids. Created a project-based internship program for students of museum studies, library science, and archives. Coordinated professional development workshops and presentations via state and national archives, museums, and library associations. Redesigned print marketing collateral and initiated active social media presence. Collaborating with local agencies to research and develop marketing collateral and promotional incentives for local tourism. Developed recommendations to revitalize the local art museum and drafted strategic recommendations report. Based on recommendations the Art Museum reopened with defined hours and has formed a small partnership with local artists for workshops space with shared responsibilities for facility, landscape, and gallery maintenance. Researched subjects for use in the Doors to the Past public history and art installment project. Assisted with selection of key subjects. Worked with Casa Grande MainStreet and volunteers to develop subject descriptions. A depiction of our Costa Rican journey in color and words. Museum Work Musings . . .